Acknowledged author wrote ADVANCED PLACEMENT CALCULUS 2016 GRAPHICAL NUMERICAL ALGEBRAIC FIFTH EDITION STUDENT EDITION comprising pages back in 2015. Textbook and etextbook are published under ISBN 0133311619 and 9780133311617. 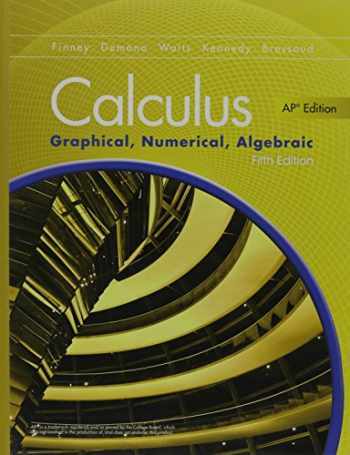 Since then ADVANCED PLACEMENT CALCULUS 2016 GRAPHICAL NUMERICAL ALGEBRAIC FIFTH EDITION STUDENT EDITION textbook received total rating of 3.5 stars and was available to sell back to BooksRun online for the top buyback price of $41.75 or rent at the marketplace. For AP Calculus AB and BC The nationally recognized author team is back with the 5th edition of Calculus: Graphical, Numerical, Algebraic written specifi cally for high school students. In this edition, renowned author David Bressoud joins the author team bringing his expertise in calculus and knowledge of the AP Calculus exam. - Nationally recognized author team with expertise on the AP Calculus. - Detailed guidance in every chapter on the appropriate use of graphing calculators, versus when students should solve problems without them. - Course is available in MathXL(R) for School, the online homework and assessment supplement, and MyMathLab(R), the fully digital course complete with eText, online assignments, multimedia, and more. Visit mathxlforschool.com, or mymathlabforschool.com for more information.